Autumn is a great time of year for many reasons; just one is that top Pinot Noir producers finally begin shipping their fall releases that have been purchased earlier in the year. Many wineries will not ship to the Antelope Valley until November, assuring that our summer heat will not impact the wine. Anticipations are high since Wine Spectator magazine’s James Laube declared the 2009 vintage pinot noir, especially Sonoma County, as arguably the decade’s best. California pinot noir has made tremendous strides since early vintners set out to produce those astounding Burgundian wines in local soil. Among the five major regions in the state to produce pinot noir (Mendocino, Sonoma, Carneros, Monterey Santa Barbara), the average vintage rating is nearly 96 points, 99 points for Sonoma which includes Russian River Valley, Sonoma Coast, Sonoma Mountain, Sonoma Valley and Green Valley appellations. As a comparison, the previousl two vintages received ratings of 88.4 and 90.8 points. 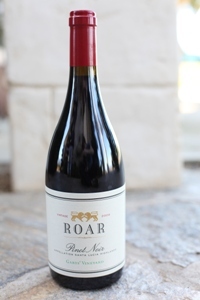 Since 2003, Sonoma pinot noir vintages have averaged over 90 points. The 2009 vintage has moved them from the “outstanding” into the “classic” category. Admittedly spoiling myself with fine pinot noir, I soon will be receiving 2009 vintages from Kosta Browne, William Selyem and Auteur from Sonoma and Seasmoke and Rusack from Santa Barbara County. Among my meager allocation and budget will be a fruity, medium-bodied Williams Selyem Pinot Noir Sonoma Coast 2009 (91/$46) and a rich full-bodied Kosta Browne Pinot Noir Sonoma Coast 2009 (95/$52), both highly touted and, more importantly, truly pleasurable to enjoy with friends. By the way, the 10/15 issue of Wine Spectator has a good story on Ed Selyem and Burt Williams, early pioneers of California pinot noir. Credit for the near-perfect 2009 vintage goes to moderate weather throughout the state and modest yields, something Brian Loring pays much attention to. The Loring Wine Company produces outstanding Pinot Noir from 10 different vineyards located throughout the state. His top rated vintage 2009 pinot noir, the Loring Pinot Noir Sonoma Coast Durell Vineyard 2009 (94/$45), the Loring Pinot Noir Paso Robles Russell Family Vineyard 2009 (94/$45) and the Loring Pinot Noir Santa Lucia Highlands Rosella’s Vineyard 2009 (94/$45) are evidence of statewide moderate weather and a credit to the winemaking aptitude of Brian Loring. Logic tells us the grapes are exceptional and the winemaking varies. However, if you find “Garys’ Vineyard” on any wine label, trust that you have found a quality wine. Although a brief perusal of our local Bevmo store revealed many vintage 2009 Pinot Noir, the Nautilus Marlborough Pinot Noir 2009 ($25/90pts.) from New Zealand and the Erath Pinot Noir 2009 ($20/88 pts.} are two that I would recommend as very good, moderately priced wines with good fruit and texture. In addition, I must give special mention to the Torii Mor “Deux Verres” Pinot Noir 2007 ($40/92 pts.) from a well-respected Oregon winemaker. This may be a “find” since I checked the winery website and they have none listed under available library wines. The trend of great California vintages in odd-numbered years may be coming to an end with much concern worldwide over the 2011 vintage. In California, it was too much rain, in parts of Europe; there was excessive heat through the spring. In other regions, periods of steady rain and extended heat played havoc with the vines. As we all know, California experienced early rainfall and plenty of it through the spring. In many regions mildew and even botrytis, a fungus that affects the vines, threatened low-yield and difficulty ahead in maintaining quality in a tough year. The Napa Valley, who experienced a near perfect vintage 2007, had unusually cool temperatures that delayed harvest. Central Coast and Paso Robles region were hit with a late frost that resulted in voluntary and involuntary fruit loss. Many Mendocino County vineyards, impacted a few years back with fire damage, had to deal with above average rainfall and low temperatures. By no means should we “throw in the towel” on vintage 2011. First, October could offer some extra sunshine and winemakers are accustomed to unpredictable weather and adapting to make the best with what they have. One prediction seems probable; that there will be less wine to go around when vintage 2011 is released in a few years. Until that time, enthusiasts should be conscious of good value wines from vintages 2007 and 2009. If one had access to acreage on the islands and was inclined to plant wine grapes, what varietals would match the terrior? Having not been to Santa Catalina, almost totally unfamiliar with its climate, I can speculate to the existence of many microclimates that can support such diverse grapes as pinot noir and zinfandel. Rusack, a small Santa Ynez Valley boutique winery, has produced well-reviewed pinot noir, syrah and sauvignon blanc for the past decade in the Solvang foothills. Rusack is announcing their first release from the Santa Catalina Island Vineyards, the 2009 Zinfandel from the old El Rancho Escondido property. So, why after many years in the wine business would Geoffrey Claflin Rusack and Alison Wrigley Rusack decide on the Catalina Islands? The answer begins with Alison’s middle name. Her great-grandfather, William Wrigley Jr. purchased the Santa Catalina Development Co. in 1919 and the family stills controls the land, including the old ranch site along the southwestern coast. That’s where the Rusack’s have planted 4.5 acres, mostly in pinot noir and cool-climate chardonnay with a small plot dedicated to a zinfandel clone, unique to their name. Geoffrey Rusack discovered some vines, apparently from an old winery on Santa Cruz Island, part of the Channel Islands chain, received permission to remove them and had them analyzed by UC Davis as a zinfandel clone. 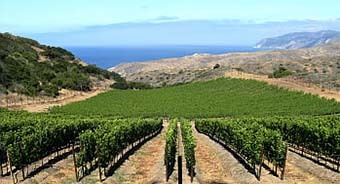 Some of the vines were relocated and planted on a small half-acre plot on the Santa Catalina Island Vineyards. The Rusack Santa Catalina Island Vineyards Zinfandel 2009 will soon be the first release from the new label. As a member of Rusack’s “Anacapa Club”, I will have an opportunity to acquire some fairly soon and am anxious to try it. Whatever trends occur in the wine industry are most likely generated in California, responsible for 92% of US production. Through good and bad vintages, our wine production will continue to grow at an extraordinary pace. A 2008 study, “Recent Trends in the California Wine Grape Industry” by professors at UC, Davis, states that wine is responsible for 8.7% of agricultural revenue, a percentage that will continue to grow. The North and Central Coast regions produce 36% of the state’s wine and regions like Paso Robles, as we have seen, have grown from 20 wineries in 1990 to over 170 today. Nature’s element, new expanded regions and near fanatic attention to terrior reminds us that holistic wine production is an art as well as a science. It is a part of our culture and will increasingly be a part of our identity. 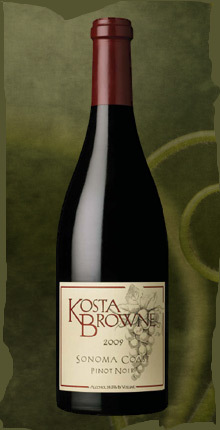 This entry was posted on Thursday, November 24th, 2011 at 9:54 pm	and posted in Kosta Browne Pinot Noir Sonoma Coast, Rusack Winery, Williams Seylem Pinot Noir Sonoma Coast 2009, Wine. You can follow any responses to this entry through the RSS 2.0 feed.